So you've already finished Mockingjay? Scholastic has posted a run-down of Mockingjay's media coverage here -- if you're already done you needn't avoid spoilers, right? Bookshelves of Doom has a fabulous suggested reading list for those of you who have finished. On it you'll find George staff favorites Incarceron, Graceling, The Knife of Never Letting Go, and The Forest of Hands and Teeth, along with lots of other great fantasy, dystopian, and adventure books to explore. Check our thematic reading round-ups for even more recommendations... or just come in and chat with a friendly Chapter Book Room staffer! Opening my daily Shelf Awareness email today -- an all-graphic novels edition -- I was only a little surprised to see my friend Robin talking about her love for graphic novels! Robin is the teen room librarian at the Brookline Library, where I spend a LOT of my free time, and I can vouch for her excellent (and expansive) taste in graphic novels. Here are a few of our favorites to try! Synopsis: The three narratives of new-kid Jin Wang, TV’s Chin-Kee, and the legend of the Monkey King come together in heart-breaking and hilarious ways to spin a new tale on the age-old theme of figuring out just where one fits in. Synopsis: “Mary Ann! Mary Ann!” Just who was this Mary Ann that the White Rabbit was looking for in the Disney Alice in Wonderland? This graphic novel, with incredibly vibrant illustrations, tells the story of the White Rabbit’s housemaid Mary Ann, picking up where the movie left off. Intrigue and fun abound! Synopsis: The struggles of a single teenager during the Iranian Revolution parallel those of a country asserting its independence in this heir to Spiegelman’s Maus. 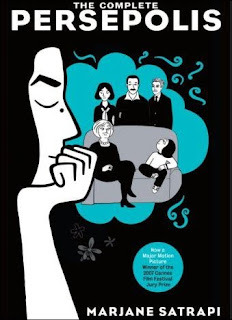 Marjane – in her dual roles as adolescent protagonist and adult narrator – is witty, courageous, and poignant; the black-and-white art is breathtaking. 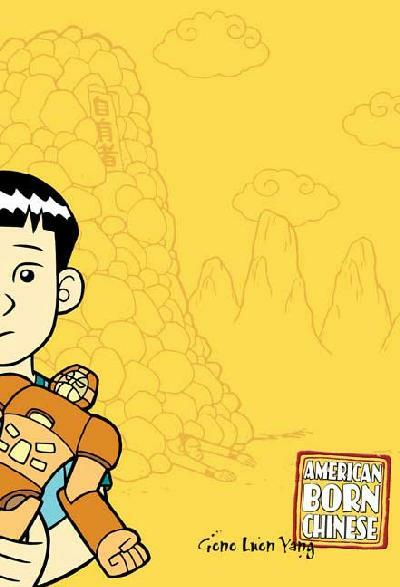 Synopsis: Great illustrations and characters that are both funny and a little deep make this a graphic novel not to be missed. Copper is a happy-go-lucky boy, and Fred is his mopey, existential dog. Together they get into all kinds of fantastical adventures. Reminds me of Calvin and Hobbes, with more fantasy. Here's hoping everyone braving the outdoors has at least one great, big waterproof item of clothing on today. I still can't even believe that 2010 is three quarters over! But, on the up-side, that means that we're starting to get 2011 calendars in! And there are TONS of awesome ones. Here are my top 3! Spend EVERY DAY of 2011 drawing genius masterpieces! Every day of this page-a-day calendar features a simple line-drawing from Taro Gomi (of Everyone Poops! fame) that you can finish with pens, pencils, crayons or markers. For example, one day, there's a foot, and you're supposed to draw the shoe that the foot is wearing! Or there's a monkey with a thought bubble, and you're supposed to draw what he's dreaming of... There will be so many masterpieces in 2011, you could send a drawn picture to every one of your friends and family members. Or keep the best ones for yourself and start your own calendar-museum and gallery! I'm so glad Charley Harper has recently grown in popularity. I remember his awesome, minimalist yet playful illustrations of animals and insects from issues of 'Ranger Rick' in elementary school, and now it seems that every month or so there's some new, cute things with his very best work beautifully rendered on it. And now, my wall can render my very favorite Charley Harper illustrations on it ALL YEAR LONG! Included in this gorgeous wall calendar are 12 amazing, huge, full-color illustrations including one of my all-time favorites, "Otterly Delicious," which the lucky July birthday boy or girl gets as a month-long birthday present! What if you could spend a whole year in the Wonderful Land of Oz? You practically could, if you made this awesome calendar yours for 2011! Put together by the Library of Congress and featuring full-color illustrations from the first edition of L. Frank Baum's classic all-American fairy tale. It's a spiral bound weekly calendar with pictures on every page. This will make all your important meetings and to-dos feel like part of an epic adventure to meet the Wonderful Wizard! Just watch out for those winged monkeys! I've long loved wordless picture books. There's something special about the joint act of storytelling between the reader and the illustrator/creator without the barrier of actual words. 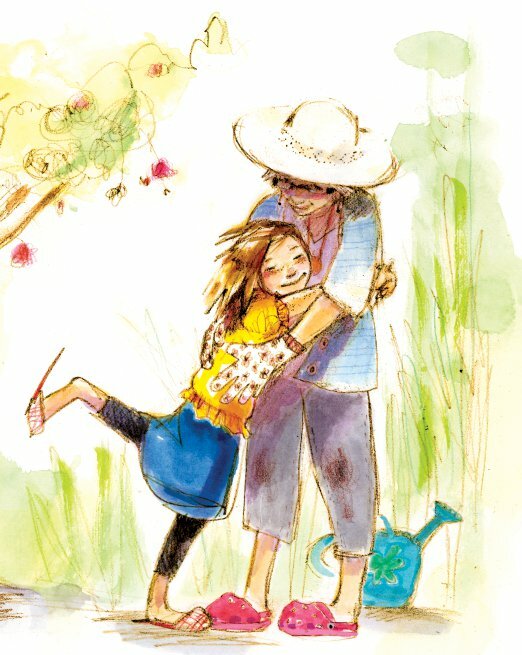 Within a wordless picture book, any child, no matter her reading abilities, can read: and even more satisfying, can tell the story to her grownups. 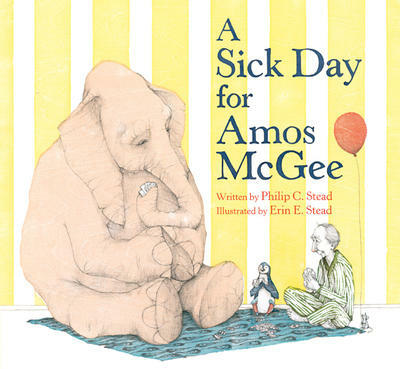 Wordless picture books can be as straightforward and humorous as Tomie DePaola's Pancakes for Breakfast, wherein a woman lacking the ingredients for this tasty morning staple finds a way to have pancakes one morning. They can be a simple day in a boy's adventures, as in Mercer Mayer's A Boy, A Dog, A Frog, and A Friend. 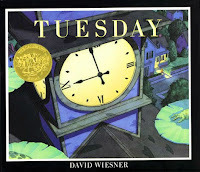 Or they can be imaginative, even abstract, like the flying frogs of Tuesday by David Wiesner or the mind-bending perspective changes Zoom by Istvan Banyai. The newest wordless picture book I've fallen in love with is a seemingly simple tale of friendship and love. But on second, third, twentieth reading, Beatrice Rodriguez's The Chicken Thief is so much more. 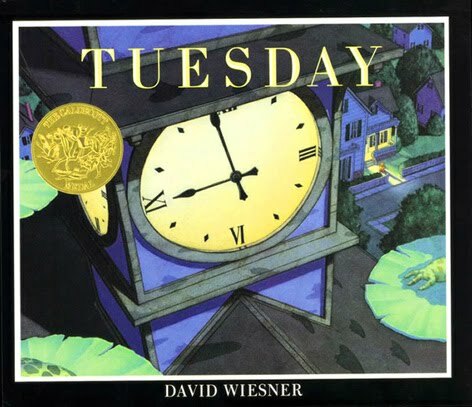 Every time I see a George alum or customer particularly fond of excellent picture books, I show them this book and pose a question after the reading. (I'll give you the question after I summarize. SPOILER ALERT!). 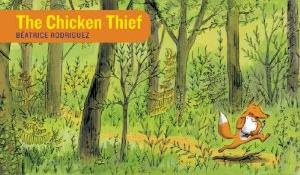 One day, a fox sneaks up on a group of various animal friends at their home in the woods, and makes off with their friend chicken. The animal friends chase the fox and chicken through the woods, over mountains and under tunnels, while the chicken and fox remain always a step ahead. Each night, the fox and chicken seem friendlier than a kidnapper and dinner might seem to be; one night they even play chess. When the friends finally catch up with the pair, the chicken gestures (because, as I have pointed out to a co-worker, in this make-believe land, the animals are still animals and don't, you know, talk) that it wants to stay with the fox, and the other animals go back over the mountains and through the woods back home. (END SPOILER!). Now I ask - is this a love story, or an example of Stockholm Syndrome? I've had a good discussion with the entire staff on this, and while most people swing toward "Love story, obviously! ", a few (including our book buyer) do consider the second possibility. (Maybe they also consider that I'm a little loopy, but this is everyday knowledge here). I hope this makes at least one person look twice at wordless picture books. Without someone explicitly telling you what is certainly happening, and therefore excluding what possibly may be happening, the act of reading becomes that much more interactive and open-ended. Sure, we know that the chicken stays with the fox, but do we know how they remain together, as friends, partners, kidnapper and sympathetic kidnappee, diner and dinner? How we choose to interpret these relationships can speak volumes about us readers, and as people. So come in and tell me what you think! I'll be waiting. Yay for Julia, Cecil, and Grandma's Gloves! If you weren't able to make it to this very special event, well... I'm sorry you missed such a great time! Fortunately, you can live vicariously through Cecil's sweet book trailer and her recap. (Definitely see Julia's touching post about her grandmothers and their impact on her GG illustrations, too!) Then you can come in and get a signed Grandma's Gloves of your own if you hurry -- they're going fast. While you're here, be sure to check out some of Cecil's YA books in the chapter book room: Rose Sees Red, Beige, and Boyproof. For even MORE Cecil, look in the short story section for Geektastic: Tales from the Nerd Herd, an anthology she edited with Holly Black. In the past few weeks we've gotten back in a handful of titles we've been pining for - and it looks like plenty of other people were pining too! 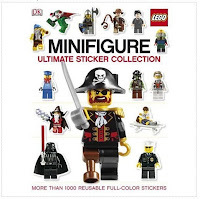 In the world-o-Lego, the popular sticker book Lego Minifigurine is back in stock and selling like...Lego sticker books do! I got this for my nephew's 4th birthday and he and his brother stopped the mad wrapping tearing to look at every page. 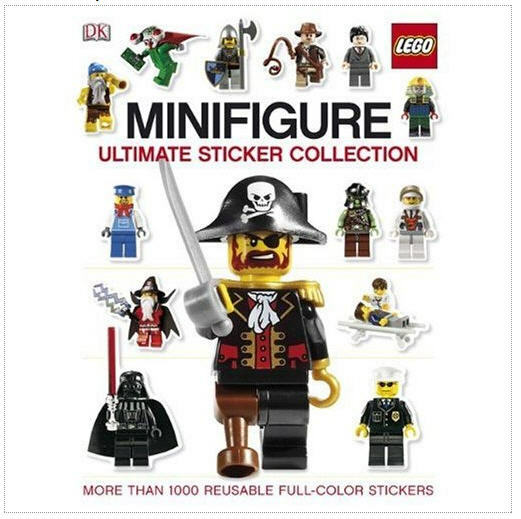 Lego folks know how to make their sticker books for sure. For the Star Wars uber-fan, Lego has brought back the Lego Star Wars Visual Dictionary, with Luke Skywalker figurine. We've had the regular LSWVD in stock, but that little Luke makes a big difference to your big (or little) SW fan. (Those nephews obsessed with the Lego sticker book? Their pop is even more obsessed with Star Wars, and I'm already planning his November birthday present from here). Other spring pi cture book favorites have also reappeared on our shelves. 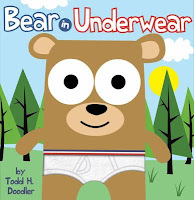 The goofy Bear in Underwear by Todd Doodler is living a second life (more fruitful than Bree Tanner's) on our features table, complete with the squishy underpants on the cover. 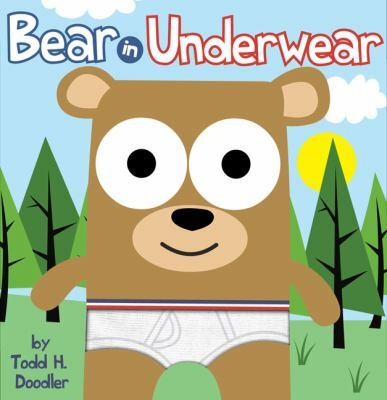 I personally find it bit bizarre that these animals happen upon a bag full of underpants. Doesn't anyone else want to know where these underpants came from? I can only hope for a prequel. 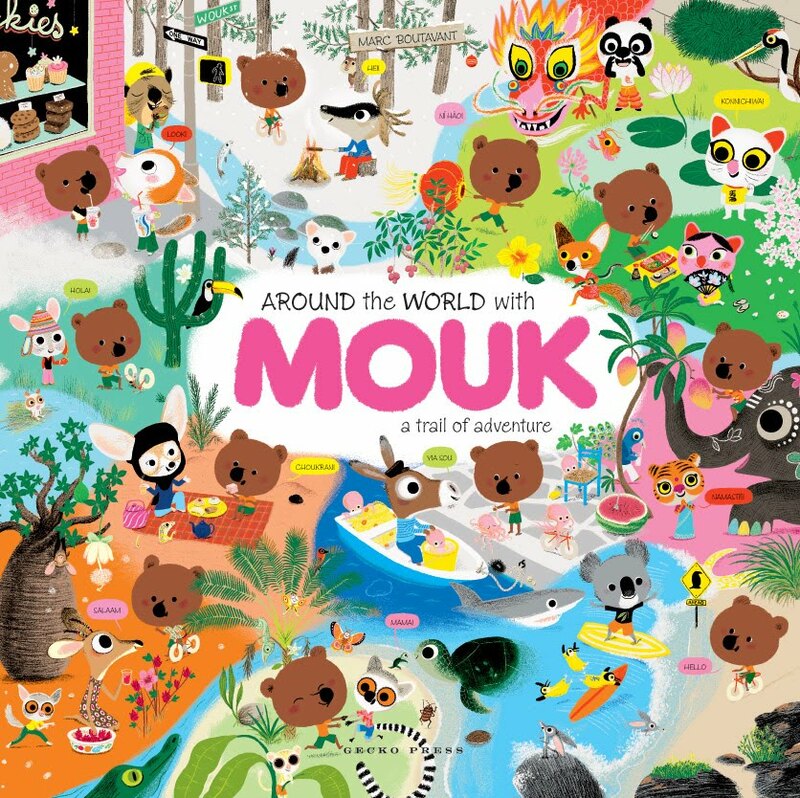 The staff favorite Around the World with Mouk by Marc Boutavant has also come back in, providing colorful, reusable sticker joy to all. I love to give this book to anyone who loves Hello Kitty or Fancy Nancy, but may want to branch out from pink princess books. 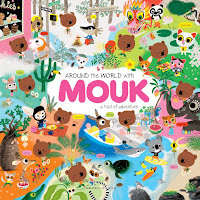 The tiny animals and conversation bubbles on every page are great for kids who pore over hidden picture books as well. 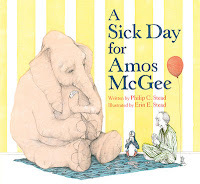 Another recent re-acquisition is my personal favorite of the year, A Sick Day for Amos McGee by Philip Stead, a tale about a zookeeper with a cold being taken care of by his animal friends. Look for the penguin's red balloon on every page! NEIBA book award winner announced! NEIBA (New England Independent Booksellers' Association) has announced the winners of its annual book awards. 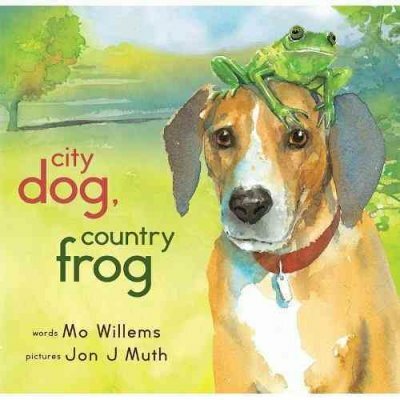 To no one's real surprise, the children's book winner is City Dog, Country Frog, written by Mo Willems and illustrated by Jon Muth. Congratulations to these two fabulous gentlemen! Once in a while you find a book that feels like it’s written just for you; this is one of mine. In Shiver, Grace meets Sam, who's an adorable musician -- at least when the temperature's above freezing. He spends the whole winter as a wolf in the woods around Mercy Falls, waiting for spring and his humanity to return. When it turns out each werewolf gets a limited (and unknown) number of years before being stuck as a wolf forever, Grace, Sam, and their friends make a desperate attempt to reverse the change. 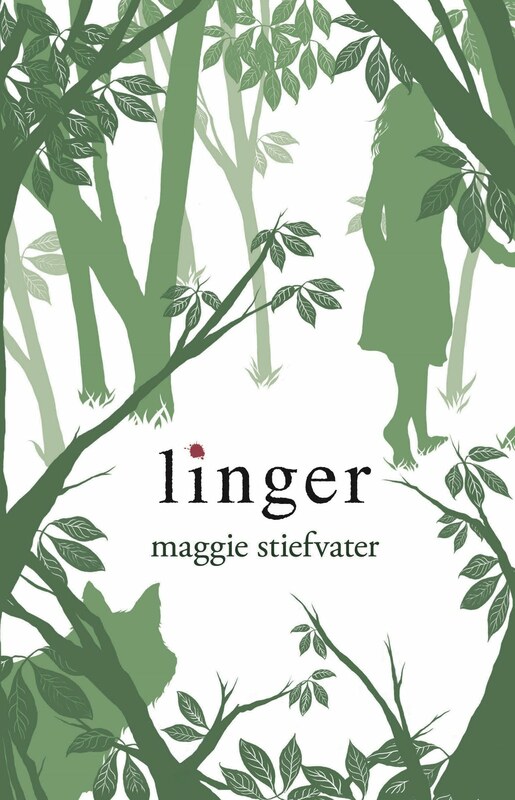 In Linger, Grace's first encounter with the wolf pack comes back to haunt her. Meanwhile, tough-girl Isabel and newcomer Cole add two more narratives to Sam's and Grace's. Indie music, poetry, and a thousand paper cranes add just the right amount of sweetness to balance suspense. These are the most lovable, heart-wrenching werewolves since Remus Lupin. Like Grace, Sam, and Cole, I'm addicted to words and music, so I can't wait to get the playlists onto my mp3 player (to listen during subsequent reads). Now what am I gonna do until the third book, Forever, comes out... um, forever from now? T-minus 6 days and counting! A reminder: This Saturday at 12pm we'll have a visit from author Cecil Castellucci and illustrator/CG alumna Julia Denos! 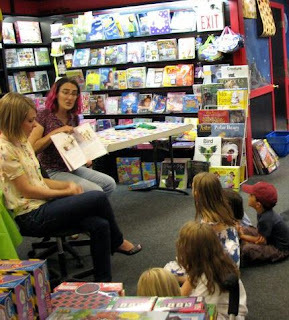 They'll be reading and signing their brand-new picture book, Grandma's Gloves. Afterwards, we'll make paper flowers and sip lemonade.